The median sales price for homes sold in Reno and Sparks, Nevada pulled back sharply in August — reversing the upward trend that has been observed all year. August’s median sales price came in at $349,000 — a 2.4% decrease from the $357,500 median seen in July. 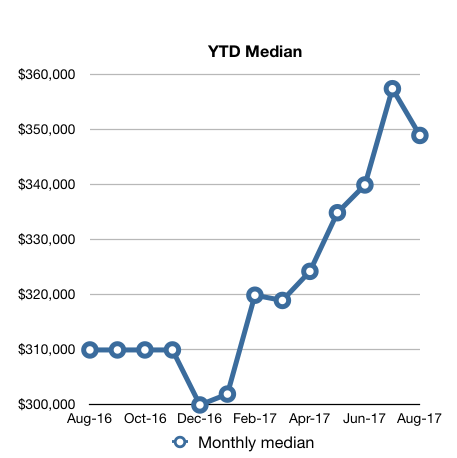 Year-over-year, August’s median sales price is up 9.5 percent over August 2016’s median of $310,000. A whopping 679 houses were sold in August. 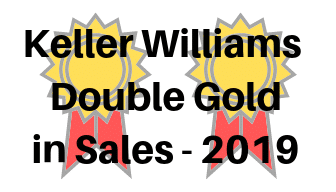 This number represents a 6.6 percent increase over July’s total homes sold, and a 13.9 percent year-over-year increase. August’s 679 houses sold brings this year’s total units sold to 4,584 — 5.1 percent ahead of the 4,363 total homes sold at this time last year. August’s median sold price per square foot (ppsf) also receded for the month to $190.45/sq.ft. — a 0.9 percent one-month decrease from July’s $192.15/sq.ft. Year-over-year, August’s median sold ppsf is up 10.4 percent. August’s median days on market (DOM) came in at 61 days — adding four days to July’s median DOM. Available inventory decreased compared to July’s number — likely, due in part, to the high number of homes sold for the month. Currently there are 952 houses listed available for sale. That number represents a decrease of 5.0 percent from the 1,002 houses available for sale this time last month. Year-over-year, August 2017’s inventory is down 33.9 percent. Pending home sales remain relatively unchanged. Currently, there are 1,032 houses pending sale — very close to the 1,034 pending sales this time last month, as well as to the 1,031 pending sales this time last year. 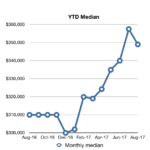 August’s median sold price for houses and condos combined was $329,000 — a 2.9 percent one-month decrease from July’s median sold price of $339,000 for combined sales of houses and condos. Note: The medians table above is updated on a monthly basis. The median home price data reported covers the cities of Reno, Nevada and Sparks, Nevada [NNRMLS Area #100]. Residential data includes Site/Stick Built properties only. Data excludes Condo/Townhouse, Manufactured/Modular and Shared Ownership properties. Data courtesy of the Northern Nevada Regional MLS – September 5, 2017. Note: This information is deemed reliable, but not guaranteed. They say nobody rings a bell at the top of the market, but that chart sure looks like what one would sound like to me. It sure seems like new construction is (finally) coming on-line fast enough, and at prices where older homes have risen to, that we are due for the cycle to play itself out. Feels like I’ve seen this part of the movie before, but maybe it’ll be …. “different this time”, we’ll see.